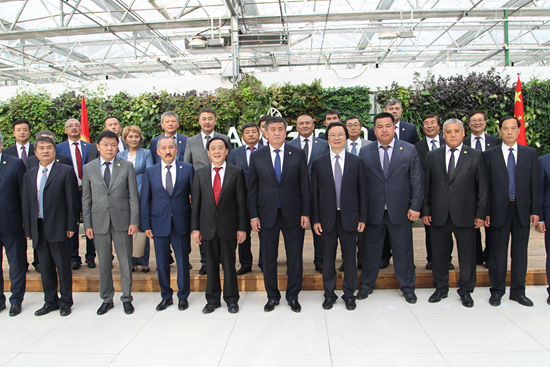 In the afternoon of June 8, Kyrgyz President Sooronbai Jeenbekov and his delegation visited the Chinese Academy of Agricultural Sciences (CAAS) in the company of Xiao Qinghua, Ambassador of China to Kyrgyzstan. Qu Dongyu, Vice Minister of the Ministry of Agriculture and Rural Affairs of China, Dr. Tang Huajun, President of CAAS, and Mr. Chen Mengshan, Secretary of the Party Leadership Group of CAAS, welcomed the president and his delegation. 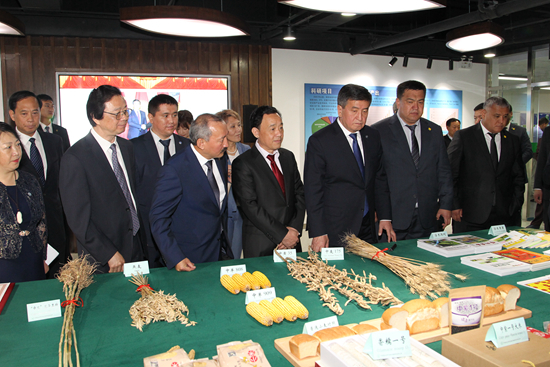 Jeenbekov was first briefed with an introduction to the scientific research and international cooperation conducted by CAAS, and then visited sites that display such achievements as new crop variety, phytase, insect-resistant cotton, animal vaccine and bio-pesticide, critical project laboratory, and the National Agricultural Science and Technology Innovation Park. During the visit, he admired China’s agricultural research achievements made during the past 40 years since the reform and opening up, and expressed his wish to strengthen Sino-Kyrgyz agricultural cooperation, especially agricultural science and technology cooperation. After the visit, Qu Dongyu and Dr. Tang Huajun had bilateral talks with Murashev Nurbek, the Minister for Agriculture, Food Security and Land Reclamation of the Kyrgyz Republic, who was accompanying President Jeenbekov on his visit to China. They exchanged views on implementing the consensus reached by the heads of the two countries and on further deepening bilateral agricultural cooperation. Dr. Tang Huajun said that Central Asia is adjacent to the cotton production areas in China’s Xinjiang Uyghur Autonomous Region, where CAAS had established a Western Agricultural Research Center to strengthen agricultural cooperation with Central Asian countries. Kyrgyzstan is an important agricultural country. The “Belt and Road” Initiative provides a good opportunity for cooperation between the two sides. The cooperation between China and Kyrgyzstan in agricultural science and technology is highly complementary and with huge potential. CAAS has outstanding scientific research teams, platforms, and outcomes in such fields as crop breeding, horticulture, animal husbandry and veterinary medicine, plant protection, and facility agriculture. Therefore, Tang hoped that the two sides can strengthen cooperation on research and jointly building experimental stations and demonstration centers. Murashev said that the agricultural development achievements made by China had drawn the world’s attention. Much of its successful experience in solving global food security problems, reducing poverty, and responding to climate change is worth learning from. Murashev hoped that both sides can strengthen agricultural cooperation on all fronts and that China may offer more support for technical exchange and personnel training. Other accompanying personnel during the visit include Xie Jianmin, Inspector of the Department of International Cooperation of the Ministry of Agriculture and Rural Affairs, Dr. Wu Kongming, Vice President of CAAS, Dr. Gong Xifeng, Director General of the Department of International Cooperation, CAAS, Dr. Zhang Huijie, Deputy Director General of the Department of International Cooperation, CAAS, and heads of related institutes of CAAS, such as the Institute of Crop Sciences, the Institute of Plant Protection, the Institute of Vegetables and Flowers, the Institute of Environment and Sustainable Development in Agriculture, the Institute of Animal Sciences, and the Biotechnology Research Institute.